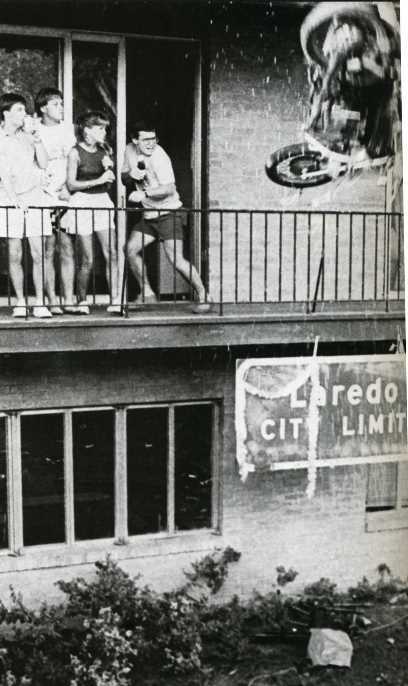 The University of Texas Phi Delta Theta fraternity denied imitating the then-popular Late Night With David Letterman habit of dropping stuff of the Ed Sullivan Theater, asserting that their annual “Round-Up Roof Extravaganza” began prior to the show’s first air date. Earlier drops included eggs and melons, then televisions and microwaves, and finally (as seen in this 1987 image) a motorcycle. I guess they weren’t familiar with collateral damage? Just proves the adage no one more dumb than some one so educated. A motorcycle is a terrible thing to waste. And how many fraternity brothers does it take to lug that up the stairs to the roof? Perhaps they were physics majors. . .or fans of Evil Knievel? As Evel said once, “Where there is little risk, there is little reward.” I guess the reward is that boys like destruction. And setting things on fire. I prefer watching The Today Show makeovers, but whatever floats your drunk frat boat, eh? This is clearly a testosterone thing. No wonder there are no patios in dorm buildings. I thought it was just to prevent suicidal students from flinging themselves over, but it also prevents couches. And did you boys never think about donating said items to Goodwill? Or what if you hit a person below? Boys!! It may have been the boys who did the tossing but the girls were the first ones to egg us on – daring us to throw things. Don’t be giving me none of your sexist attitude – you instigator you. ha! 😀 . I think the guy on the far right wet his shorts. The cowering guy never got a date again after this photo was published. Poor dude. Stupid frat brothers, I must say.